Now most would think that Sora meets the first nobody in Chain of Memories, I don't think this is true. So, when does this occur in Kingdom Hearts I? Actually, it occurs early on during the game just as you start exploring Traverse Town. First thing you step into District 2 ( Part 1 / Part 2 ) you are greeted with a cutscene of a man running away from something/darkness. His heart is then stolen and he becomes a Solider Heartless. Now that a Heartless was created, a Nobody must also be created. But, you ask, when do we meet the Nobody? That's a bit later in the game, after Cid opens a Gummi Shop. From this point on, some one else is left to run the Accessory Shop. I'm sure we have all asked ourselves this, is the guy that runs the shop and the guy that lost his heart the same person? I say yes, but further sit state that, the Accessory Shop Guy is really the Nobody of the Man Who Lost His Heart in District 2 of Traverse Town! Just think about it, it make perfect sense. In Kingdom Hearts 358/2 Days there is a Nobody Moogle part of Organization 13 that supplies the agents. So it's not like a Nobody working as a shop keep is unheard of. Likewise, I believe, the first time you meet him he states something along the lines of, "I don't know how I got here, I was given this job by Cid". Note: I am working for memory on this part. I just don't have the time to go back into the game and research this v.v As a result, can someone go back and 1. see what is the first thing the Accessory Shop Guys says (Take Screen Shots / Record) and 2. see if there are any dialog options you can have with him (Take Screen Shots / Record). Am I onto something here or not? Also, have you heard this before or ever did think about it? Yes, you're right. The first Nobody Sora meets is in KH1. FM. Nobodies are actually rare and don't appear every time a Heartless is made. It's only a once in a while occurrence. i wouldn't pay much attention to the NPC that appears suspiciously like the one who had his heart stolen. If that guy was strong enough to become a humanoid Nobody, Org. XIII defiantly would have gone and swepet him up. They appearance have a Spidy-sense for that. I'm pretty sure that was just a regular Moogle in a coat, lol. Not to mention that human-shaped Nobodies are actually much rarer than those who possess twisted forms, which are already rare. The random guy is just your normal average Joe. He could not have been someone that strong of heart that he formed a Nobody when his heart was lost. I never remembered meeting these characters from the original or are they from 1.5? 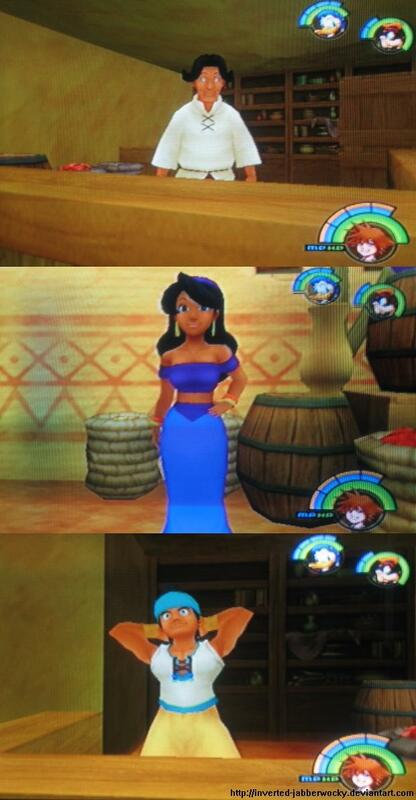 As I recall, they're in vanilla KH, Agrabah, you just have to be there at a specific time. I think you can only see them right after you seal Agrabah's Keyhole. It's assumed they're hiding from the Heartless most of the time. Your probably right, I just found it strange they would use that character model. There were plenty of people around District 1 that could have been moved. The random yet well dressed fat guy, the waitress, Tidus (child), any one of the 3 ducks next door. 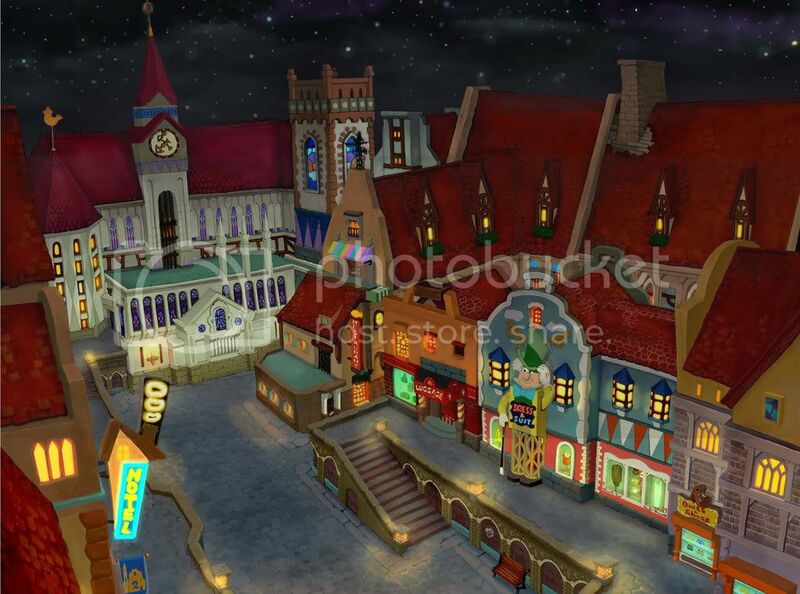 any one of the Moogles (Already in the shop), hell you even meet pinocchio when the shop is empty stealing things because Cid left, and then you help bring Geppetto and pinocchio to Traverse Town. So many choices, and yet, he gets pick. Seems a bit suspicious to me. Likewise, for all we know, he could be an ultimate badass. It could be that he toke on so many heartless, he just got tired or something. That and I though that some of the organization members were scientists before they became nobodies. So. . .
Well, now I am going to have to replay the game (really want to see that waka look-alike in person). Do you know if they can be talked to? Though, it makes one wonder, why not just change the color to red or something. Especially since you'd be dealing with the guy for the rest of the game. I reckon if you find them, you can speak to them. I haven't been able to bump into those NPC myself. I'm not sure if I'm doing it right because as I've been told, they appear after Agrabah's Keyhole is sealed, but as soon as you do that the game kicks you off that world. I go right back to look but I don't find them. I'm sure someone else has more accurate advice. I really never chanced upon that Agrabah guy in any of my playthroughs. When was he supposed to be there? I thought the map he was in was almost always infested by Heartless, and in the very few times it wasn't (if at all), I never noticed him. He could not have been someone that strong of heart that he formed a Nobody when his heart was lost. How do you know? That guy could be the most selfless, loving, and charismatic guy in the universe.. Y-you don't even know him! Yeah Solosis, quite being so judgmental. I bet he at least got Dusk ranking. Dusk or not! In any case, the shopkeeper couldn't have been average Joe's Nobody and thus Xemnas still holds the distinction of the first Nobody Sora came across. If the shopkeeper was indeed a Nobody, who could have extricated him from the Realm of the In-Between? Isn't that where all Nobodies were born? I didn't play along well, did I? You don't have to tell me. When the Keyhole is sealed in any world there is a period of calm directly afterward where you can explore the world free from Heartless interference. Once you leave, though, the Heartless return. So, in order to see the Agrabah NPCs you have to explore Agrabah directly after you seal the Keyhole and obtain the Genie summon. IIRC, not only do you have to seal the keyhole first, but you also have to go out of your way to go to those regions without leaving the world. For some reason, they only appear when the Heartless are gone from the world...which is ONLY after you seal the keyhole. He was there in my last playthrough after I sealed the keyhole and received the gifts from Genie and Aladdin. He's in the plaza manning the stand directly left of the storage doorway. I'd headed back there to use it's save point to leave for the green trinity. I spoke to him curiously because it's the first I've ever noticed him and he said something about how everyone is hiding from the heartless I believe. Also I believe the gentleman standing beside the shortcut to the third district of Traverse Town is also a look alike of the accessory shop gentleman. So sorry to disappoint you, while your theory is very clever and well observed he's not a Nobody, merely a recycled model. This is why the accessory shop gentleman resembles the character in question. Besides humanoid Nobodies don't tend to resemble their human forms that closely. Look at Roxas and Namine. Xemnas could be considered something of an exception, he pretty closely resembles Ansem. (sorry I am basically assuming based on the spelling that Xemnas is Ansem's Nobody, as it's an anagram for Ansem just as Roxas is of Sora. Namine is the only Nobody to not follow that rule but she is a special case, having been created somewhat differently). So perhaps in some cases but it seems not in most. They are special cases, though. Roxas didn't appear to resemble Sora - Ventus instead - because he "borrowed" his form when he was born. Namine is enshrouded in mystery as she sort of came out from nothing, but I believe Xemnas' appearance is close to that of an aged Terra considering that Apprentice Xehanort is, after all, Master Xehanort in Terra's body. Besides, the former Organization members appear to bear similarity to their human forms. Xigbar, Xaldin, Vexen, Lexaeus, and Zexion all resemble Braig, Dilan, Even, Aeleus, and the resurrected Ienzo, respectively, with only very minor tweaks in their appearance (hair in Xigbar's case). Even with their age differences, young Lea and Isa are also more similar to Axel and Saix, respectively, than Sora is to Roxas, and grown-up Lea is essentially a physical carbon copy aside from the teardrop tattoo he could have gotten during his time as a Nobody. Roxas doesn't look like Sora because Sora retained a physical form when he hugged Kairi, so the nobody that was formed shaped itself after the other heart residing inside Sora, Ventus. Namine came from Kairi's heart, but again as Kairi had her physical form still the nobody that was formed only slightly resembled her. It's not a stretch to say her blonde hair additionally comes from Ventus, but that's never been confirmed anywhere. I'm not sure why Xemnas and Ansem SoD actually look different to each other to be honest, maybe it's because Ansem is a heartless? Xemnas is or would be identical to Apprentice Xehanort (in Terra's body lets not forget) if he were still complete. All of the other completed organisation members that we have seen look near on identical to their nobody counterparts. Roxas and Namine are the exceptions to the rule for the reasons stated above.